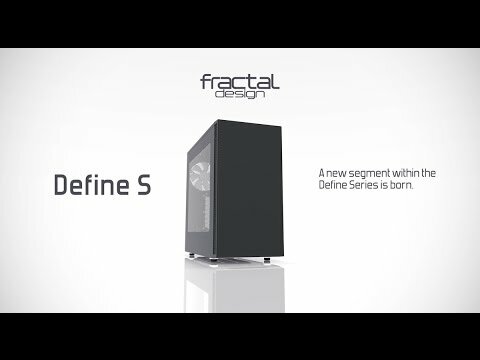 Product Overview The Fractal Design Define S lends the appearance, sound dampening technology, and support for a wide variety of components from the widely popular Define Series, while introducing a new, innovative internal layout. The Define S case is packed with intelligently designed enthusiast-oriented features delivering a silent case with powerful and expansive air and liquid cooling support, presented in a stunning Scandinavian inspired construction. The Define S case reaches the highest level of silent computing through strategically placed dense sound-absorbing material, multiple ModuVent™ fan vent covers and finely tuned Dynamic Series fans. Fractal Design Define S Black Mid Tower ATX/mATX/mini-ITX Computer Chassis with USB 3.0 + Silent Design is rated 4.5 out of 5 by 10. Rated 5 out of 5 by m1k3 from Great value for money if you don't need HDD racks or DVD drives Basically this is the Define R5 without the HDD racks and DVD drives at the front. This means better airflow from the front vents, at a cheaper price. The case was very easy to work with. It has thumbscrews for the side panels, velcro straps to help with cable routing, and special tool-less holders for SDDs & HDDs. Only 4/5 for quality because some of the threaded screws had powdercoat on them which made them difficult to screw in. The case is very quiet with a stock AMD Wraith Spire cooler plus two fans on a 1050Ti, and case temperatures are fine even under load. Rated 2 out of 5 by Alex79 from Good case shame about the included fans The case itself is good but as packaged with the fans it is a bit of a disappointment. The case is supplied with two fans the first of which was clicking / catching upon arrival. I contacted Scan who worked with Fractal to send out a a couple of replacement fans. Just two months later and one of the replacement fans has now started clicking / catching just like the one it replaced. I appreciate I might just be unlucky but if I were to buy another case from Fractal I would be budgeting for after market fans. Rated 5 out of 5 by LukeITtech from Simple design, spacious and well made. This case may cost an arm and a leg in comparison to what some people look to spend on a case, and the lack of a space for a 5.25" CD R-W was a little bit of a let down. However, the case has space for a total of 5 2.5" drives/SSD's or 3 HDD's and 2 SSD's, so theres more than enough space for storage devices. The case also comes with 2 of Fractal Design's Dynamic GP-14 140mm fans so enough for good airflow if your liquid cooling. Speaking of which I also used there Celsius s36 and top mounted the 360mm rad and there is still more space left around it, and if you like me were wondering about the top hex grid the case comes standard with top covers and they are easy enough to remove or you can leave them in if you don't need the top fans. With all of the carriers for the drives being on the back it means there are no carriers in the front, leaving space for resivours for custom water cooling loops or a stupid amount of space for GPU's etc to extend into or front mount the rad for an AIO liquid cooler. Cable management is also nice and simple with this case as the cables loop through a grommet at the bottom next to the PSU and up through the back of the case with several channels to route the cables and grommets in key locations where cables would plug into the board or other components. The case also has an excellent build quality and some weight to it as well because of the heavy side panels that are sound proofed. Overall a brilliant case in my opinion and and excellent product and would recommend to anyone. Rated 5 out of 5 by ZmanSupreme from Loads of room, while keeping 3 HDD mounts and 2 ssd mounts Extremely spacious case, heavier than most cases, but makes up for it in construction quality.The case is almost silent with the thick sound dampening side panels, I Upgraded from a Corsair spec-01 as I wanted a quieter pc with room to upgrade to a 360mm watercooling setup to quieten things even more. The case is simplistic in its design and is extremely easy to work inside with a plethora of room to get your pc set up quickly and easily. Rated 5 out of 5 by Andy27 from Excellent, good looking, quiet, great layout at a good price Although a little larger than I had envisioned, this case makes installing a new system easy - plenty of space and a great layout with lots of options for fans. I replaced the stock fans with Noctua fans (which I use on my other machines), have a Noctua CPU fan and used a silent PSU - and in normal use it is really almost silent! One minor issue (which is why I scored quality down a notch) was that the side panel retaining screws are a little short and, as a result, one of the holes on the top of one side had become threaded when I received it. Reported this and got a replacement via Scan (very efficient) but it also had the same problem - so either a batch issue or a minor design flaw (but not one that affects the case in any significant way, as the sides fit snugly anyway). Rated 4 out of 5 by EngineerFatherof4 from Good, not perfect I don't build very often. Spent ages looking at reviews. I have no HDD, just one NVME and one SSD, so I do not need any drive racks. Picked the Define S. I moved the rear fan to the front (positive pressure). Installed radiator of Radeon Fury X in rear fan spot. It is quiet, FuryX does pump a lot of hot air. Downs 1 - (minor but silly) MATX posts are marked in the wrong places! I put them in, picked up my Asus H170M-Plus MB and found I needed to move them. 2 - much bigger disappointment - the front fan filter can only be cleaned by taking off the front panel, for which you need to remove both side panels! I don't recall any review pointing this out. Why can't we have filters that are removable and replacable with the chassis in place? I had accepted that the bottom filter has to be removed from the back, because almost no cases offer an alternative. I realise that I had assumed that such a highly rated chassis would have a good front filter system - wrong - no door at all. 3 - supplied fan leads are not long. My Asus MB has good fan control options but the connectors are at the back of the board so the front fan leads do not reach! I live in a home, not a clean lab. I have a dream of pumping heat out of the chassis in liquid, rather than pumping dusty air through the chassis. Still an expensive proposition. But at least this chassis has some space I could mount bulkhead connectors. Rated 5 out of 5 by Barking from Excellent value for money Having owned this case for nearly nine months now, I felt I've owned it long enough now to post a review. The first thing I must stress is that this case does not include a bay for an optical drive. My setup is air cooled. I replaced the included fans with PWM fans, so I could control each fan individually from AI Suite in Windows. I have three fans at the front and one at the back for positive air pressure. The case is quite roomy with plenty of space to hide cables out of sight, leaving a prettier build. Some Velcro straps are included to help achieve this in tidying the cables up. The panels are padded to suppress sound and they do a good job of this. The case and panels feel quite solid, not at all flimsy. This case oozes quality at a great price in my opinion. My only regret is perhaps I should have ordered the windowed variant, as this is my tidiest build to date. Rated 5 out of 5 by Daimonde from resubmitted They want me to resubmit, presumably cos i put an url in of a youtube review of the case. took me ages to write that glowing review. can I be bothered again ? no. case is great, search for youtube reviews of it. buy one.